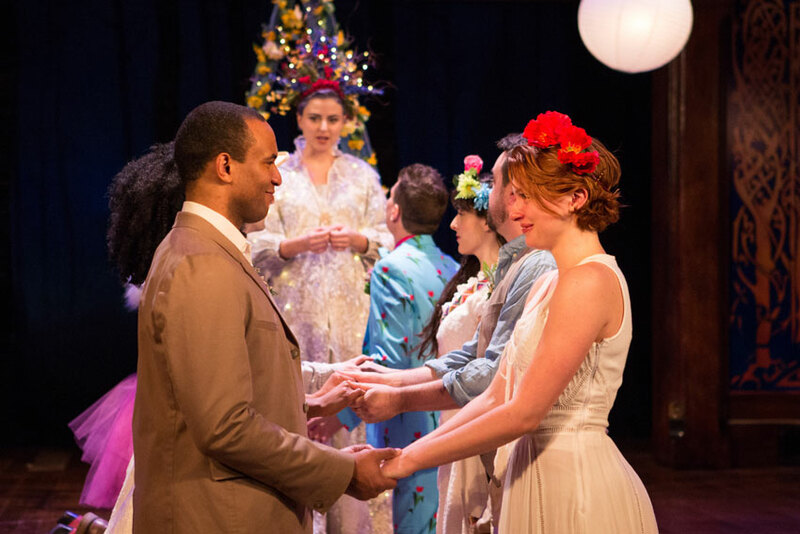 Orlando (Lorenzo Roberts) and Rosalind (Lindsay Alexandra Carter) wed in the enchanted Forest of Arden, along with other couples in Shakespeare’s As You Like It. Folger Theatre, 2017. Photo by Teresa Wood. When Meghan Markle and Prince Harry walk down the aisle at Windsor Castle later this month, they’ll bear the weight of centuries of English tradition on their shoulders. But will they live happily ever after? And what exactly constitutes a happy marriage? At times like this, it’s only fitting that we turn to that acknowledged expert on human behavior, William Shakespeare, to see how he viewed matrimony. Every play-goer knows that Shakespeare’s comedies, despite bickering and cases of mistaken identity, frequently end with the promise of a wedding—in some cases, multiple weddings—proposed on stage amidst merriment, feasting, dancing, and song. In short, it’s a jolly time for all, with marriage epitomizing the quintessential happy ending and the joy presumably continuing long after the play ends. The history plays and tragedies, however, paint a somewhat darker picture. Marriages are often tainted by jealousies and suspicions, couples battle as rivals or plot together as conspirators, and there are frequent estrangements, even divorces. The wedded state is portrayed as anything but a source of bliss. Then perhaps Shakespeare’s own life might offer a clue? There are three things that everybody “knows” about his marriage: that it was a forced affair because Anne Hathaway was pregnant, that his being away in London so much of the time indicated that the couple was not close or happy, and that he dissed her by leaving her his “second-best” bed. Alas, these don’t bear up well under scrutiny. Shakespeare and Anne Hathaway did wed when he was only 18 and she was 26 and pregnant. While it’s tempting to imagine that the Elizabethan equivalent of a shotgun was involved, many scholars have questioned this assumption. For one thing, as many as thirty percent of brides arrived at the altar in the family way, so there was little social stigma attached if the couple had been formally betrothed or “handfasted” in public. Instead, some have suggested that the reason might have had more to do with Shakespeare’s career aspirations. Given his age, it is likely that he was serving an apprenticeship of some sort—and marriage was a way to break that obligation. Marrying Anne would have left him free to pursue other vocations, such as, say—playwriting. And as for that second-best bed, it was far from a slight. In Elizabethan households, the best bed in the house was reserved for guests, so Shakespeare was merely bequeathing their marriage bed to his wife. Whatever his own views, Shakespeare’s work continues to provide what Dolan calls “a language for passionate desire, intimacy, attachment, and love.” Frequently evoked at weddings, his words can scarcely guarantee that All’s Well That Ends Well—for the royal couple or anyone else—but then, what can?